Is English your first language, I see your image is from Russia. That is a moderately complicated arangement of resistors (we do not call them conductors) and each resistor has its own resitance. The combination of these resistances in the particular circuit arrangement can be replaced at the power supply by a single equivalent resistor. Is this what you mean by total resistance of the currents in the conductors? You have drawn a DC power supply symbols, but 120 volts is unusually high. 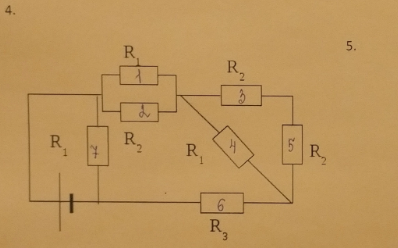 you have two R2 s in series (right hand corner), simplify by replacing this by one resistor of the right value . continue this till you have just one value for the whole circuit .